It doesn't much matter if you like messy buffalo wings, fancy wings, or some other exotic kind of fried flapper we've never even heard of. People love chicken wings. Like, they really love them. 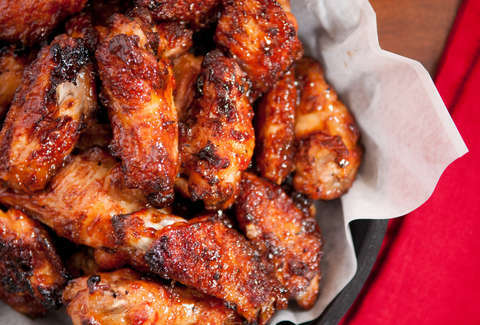 In just one day -- the Super Bowl, of course -- Americans eat 1.3 billion wings every year. So, raise a damp, orange napkin to the beloved chicken wing on Sunday, July 29 for National Chicken Wing Day. The day was first proclaimed by Buffalo, New York Mayor Stan Makowski in 1977 and several restaurant chains across the country -- Hooters, Wing Stop, Atomic Wings, and more -- are celebrating the occasion with deals for free wings or super-cheap wings. Take a look below to find the places where you can dig up free and discounted chicken wings in honor of this fowl holiday. Go forth and do as you do. Get your dry rub on or dip it in blue cheese. You'll have greasy fingers in no time. The deal: Order 10 wings and get 10 boneless wings for free. You don't have to say their tagline for the day, but no one will fault you if you can't help but say, "Let FREEdom Wing." It's cheesy, but you kind of want to do it. Right? The deal: In addition to making their spicy Korean flavor a fixture nationwide, you can grab five free boneless or classic wings with any purchase on National Chicken Wing Day. The deal: At Buffalo Wild Wings locations across the country, you can get a free snack-sized order of wings with the dine-in purchase of any small, medium, or large order of wings. The deal: Buy a little now, get a little later at Epic. Get a bone-in single meal and fountain drink, and you're next single meal and fountain drink is on the house. The deal: Take 20% off orders of wings placed in-store or ordered via phone/online. The damn fine wing joint is also running a giveaway for $100 gift cards. Enter by downloading the mobile app and placing an order. The deal: Get 10-cent wings all day long with a maximum of 10 wings at the sale price. The deal: It's 50% off wings all wings all day long. The deal: All day long you can celebrate fowl food with 50-cent bone-in or boneless wings if you're a reward member. (There's a maximum of 25 wings at the discounted price.) You can register for a table online in advance if you're worried about getting space. The deal: Wings are the usual price, but you can win free wings for a year at each of Anthony's 66 locations in the US. Every time a loyalty program member places an order from July 11 to July 29, they'll be entered in the contest. There will be one winner at every location who gets a credit for one 10-piece wing order per week for an entire year. 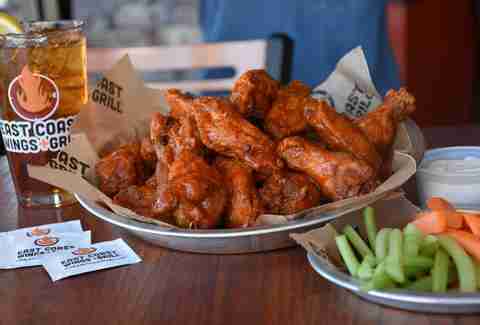 The deal: Grab 75-cent wings (in increments of 10) and $1 Miller Lites all day. The deal: For a limited time, Popeyes is offering six boneless chicken wings in its Louisiana seasoning, plus a side, buttermilk biscuit, and dipping sauce for just $5. The deal: All co-branded locations are offering free delivery on chicken wings ordered through Postmates when you use the code "FATWINGS." The deal: Get any sandwich except a Signature Sandwich or a Quarter Pounder for just $1 with the McDonald's app. Here's everything you need to know. The deal: Sign up for the DQ mobile app, and you'll automatically get a free small Blizzard. Here are the details. If you know of National Chicken Wing Day freebies and deals we missed, email us at news@thrillist.com and we'll add 'em here.